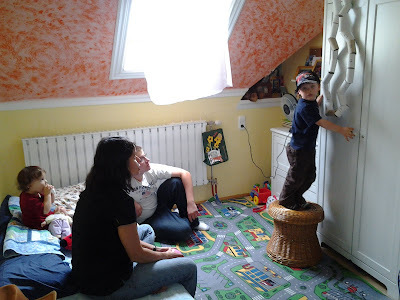 Nick and Rosemary's Blog: Counting Down OR How to Save Money as a Parent, Part 3. Counting Down OR How to Save Money as a Parent, Part 3. Tomorrow morning Balázs leaves to Vajta for 1 month to serve as a volunteer in the Summer of Service program. We are excited for him, and expect that this will be a great experience and that he will grow a lot as he serves the Lord there. We told Nate today that Balázs will be gone for a month, and he was pretty sad about it, and told Balázs that he should stay home and not go. So Rosemary made a way for the kids to count down the days until Balázs comes back. 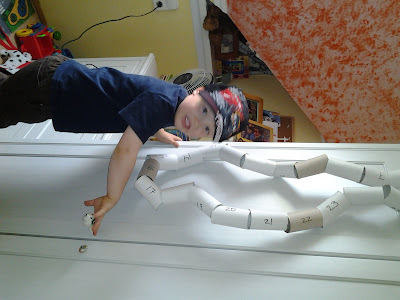 She strung together old toilet paper rolls and numbered them and hung them up in Nate's room. Every day they will take one roll off, until Balázs gets back home. God bless you, Balázs! Have a good time in Vajta. We'll be counting the days until you return.